Type and Characteristics - Twin screw, steel-hulled patrol gunboat, Gunboat No.1, later PG-1, Yorktown-class, built by William Cramp and Sons, Philadelphia, PA, laid down 14 May 1887, launched 28 April 1888, commissioned at League Island, Philadelphia Navy Yard 23 April 1889, 1,910 tons, 244ft long x 36ft beam x 14ft draft, 16kts, armed with 6-6in, 4-3pdr, 4-1pdr guns and 2-30 caliber machine guns, armoured deck, 191 crew. First commanded by Cdr French E Chadwick. Log Period and Areas of Service - 1898-1919, European waters, Mediterranean, American waters, Pacific Squadron, coast of Central and South America, Alaskan waters, Asiatic Squadron, Philippines. 1889 and 1891 – Served with "Squadron of Evolution" off American coast, developing tactical manoeuvres for USN. 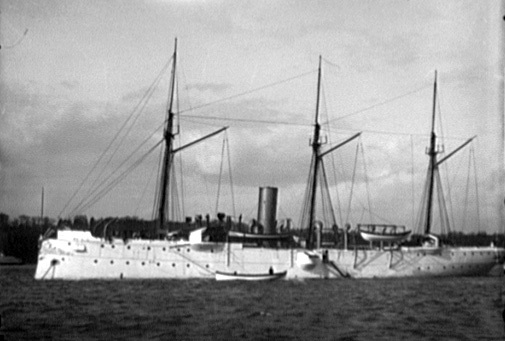 1889-90 – Service in European waters, including Mediterranean, before returning to New York Navy Yard for repairs. 1891-92 – Joined Pacific Squadron, serving off coast of South America. Played important part in preventing war between US and Chile after two USN sailors had been killed in riots. Repaired at Mare Island Navy Yard, CA. 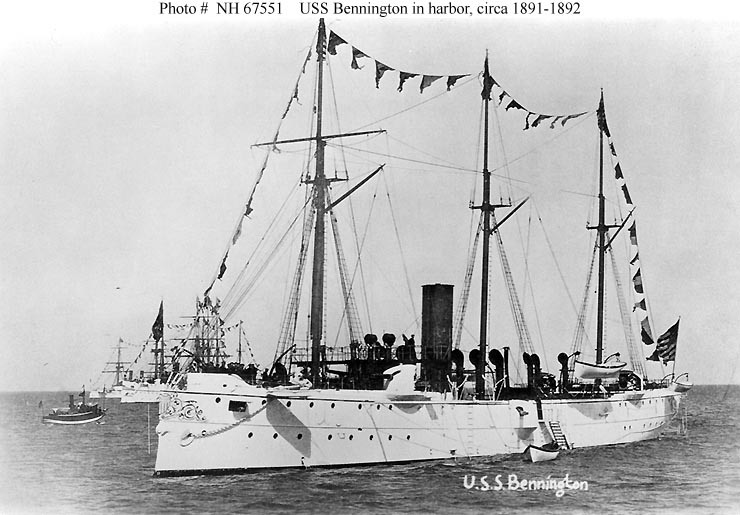 1892-94 – Took part in seal-protection and other duties in Bering Sea area, including trials of new telescopic gunsight. Spent periods repairing at Mare Island on West Coast and Norfolk, VA and New York on the East, returning from the latter via Cape Horn each time. 1894-97 – Asiatic Station, showing the flag off China and Japan. 1897-98 – Decommissioned at Mare Island during Spanish-American War of 1898. 1898-99 – Returned to Asiatic Station. Based at Cavite Navy Yard and patrolled for gun-runners off the Philippines. 11 April 1899 – Rescued a trapped Spanish garrison on the west coast of Luzon, but four sailors were killed, and the survivors taken prisoner. Later freed by the US Army. 1900 – Took part in Chinese "Boxer Rebellion". Landing party served ashore at Taku. 1900-03 – Continued pacification duties in the Philippines in cooperation with the Army. 1903-06 – Arrived Mare Island and decommissioned for 3 years. 1906-12 - Served off Pacific coast of Central America, and later South America, protecting American interests. Summer 1907 – Seal protection in Alaskan waters. December 1909-March 1910 – Served with Nicaraguan Expeditionary Squadron. 29 May 1911 – Rescued survivors from foundered steamer Taboga. 1912-13 – Decommissioned at Mare Island. 1913-14 – Service off Pacific coast of Central America, especially Nicaragua again, before returning to Mare Island for repairs. 1914-18 – On patrol off Pacific coasts of Central and South America, including the World War 1-period. Refitted in 1918 again at Mare Island before sailing for East Coast. August-November 1918 – Escorted coastal convoys off American and Canadian coasts. 2 January 1919 – Departed New York for California. 15 February 1919 – Arrived San Diego. Fate - Decommissioned at Mare Island in June 1919, sold to Oakland, CA, company in September 1921.